Identifying the right brand of carpeting for your home can seem impossible and even more daunting when you begin to consider the variety of options available. Choosing fiber content (wool, nylon, polyester), carpet style (loop, shag, recycled), stain protection solutions, color and warranty choices may have you looking at your old carpet as not so bad after all. Area Floors design consultants understand how overwhelming carpet shopping can be we are here to help if you need us. All carpeting looks pretty much the same on the surface making it hard to understand why one carpet is so much more expensive than another. But, we all know that looks can be deceiving and it is our goal to help you identify the differences beyond the surface by comparing three carpet brands. The family friendly carpeting solutions from Godfrey Hirst Carpet, Mohawk Flooring and Shaw Floors are similarly rated for durability, price, and maintenance. 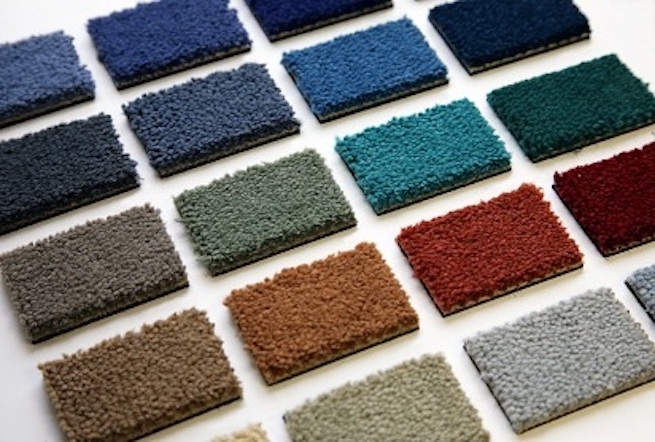 Godfrey Hirst Carpet offers a wide range of residential and commercial carpets. Easy Living@Home is made from Polyester Spectral Solution Dyed Fibers. What this means is that the polyester strands that make up the carpet have been colored in a bath of dye, as the carpet is being made rather than applying the dye to the finished product. The type of fiber used in these polyester carpets creates a thick and full softness to the touch. Polyester is also a non porous material making this fiber stain resistant. With a polyester carpet you can almost always expect a lower price. The entire line of Easy Living @ Home is so stylish it will fool you that it’ so economical. Shaw Floor’s Anso Nylon “The Color Wall” in 80 different colors may look just like the others but there is one big difference, its made of nylon fibers. Anso Nylon is 20% stronger and keeps its shape much better then any polyester carpeting fibers. The ideal carpeting solution for families with kids, pets, and busy lifestyles looking for a long-lasting carpet that cleans up like new time after time. Cleaning this carpet is easy, with the added R2X stain and soil resistance. Spills sit on top of the carpet and won’t sink right in giving you time to react and clean up the mess. Slightly more expensive but well worth the investment, nylon carpets will continue looking new for many years to come. As with all of its flooring, Shaw Floors uses recycled materials that are engineered to be recycled, Anso® nylon contains post- consumer carpet and has cradle-to-cradle certification. This carpet is one of the softest around. What we like about Mohawk’s Smartstand Silk is the feeling you get when you rub your hand across the fibers, you won’t want to sit on your furniture ever again. This carpet will certainly keep your toes comfortable with its unique soft fibers. The down side? This carpet is thick and so soft its hard to vacuum. Something to think about if you want this soft carpet in your home. Made partly with corn, Smartstrand is environmentally smart emitting 63% less greenhouse gas. Made from BCF Triexta, Smartstrand is the only carpet with built-in stain and soil resistance that will NEVER wear or wash off. Mohawk said it wouldn’t stain and proved it by performing a stain removal test for us. We were amazed at how easily the mustard, red wine and other stains disappeared. See for yourself in the video. Now that you have a better understanding of carpet materials and features you are ready to match these qualities up against your carpet requirements. Learn how to choose the right carpet for your home, browse some of our carpet catalogs online for color and style ideas or visit our showroom to feel the difference in carpets. Bring in some swatches from the room you are remodeling and our Flooring Experts will help you compare carpets based on your budget and needs.